With thoughts turning to spring I went along to Velorution and was tempted into buying a Schindelhauer Siegfried single speed bike. There are a lot of reasons to commute to work by bike. The main reason for me is that it embeds exercise into my day. I'm not much of a gym person and since I have to actively choose to go it makes it far too easy to skip! Whereas, I have to commute every day so I might as well exercise as part of the journey. To achieve the minimum of 2.5 hours of exercise a week I need to make commuting by bike as easy as possible - removing as much choice and friction as possible. Jumping onto the bike has to be more comfortable, easier and fun than taking the train. Like everyone I tend to be a bit seasonal - in winter I cycle less than in summer. But, the other obstacle is the hassle of organising cycling clothes and showering in the office. It means finding all the right clothes first thing before you're awake, skipping that warm shower at home, and then having to queue with everyone for the public shower in work only to discover that in your disorganisation you've forgotten your shoes so will have to wear cycling shoes all day (really happened!). I started using N's Brompton which is a great little bike and the number of commutes I've done has been steadily increasing. It's easy to cycle when you can use your street clothes as there's almost no organisation needed. Since cycling and getting the train take the same amount of time for me the only thing that adds friction is the weather. I literally have to decide not to ride the bike. The fact that it's foldable is really useful as you can jump on the train if you don't feel like cycling home in the evening. But, even if it is a cult, it is also slow. Well perhaps sedate is a nicer term. So I've been on the lookout form a commuter bike. Something that is a mix of the speed of my road bike and the ease of use of the Brompton . Since my journey is through central London a single-speed seemed the right choice for low-maintenance and a bit of a workout. It has to be beautifully designed and classy. And, great engineering is key because quality and durability are really important to me. N found Schindelhauer a small German manufacturer that's been getting plaudits for their design and engineering. The first thing that attracted me is that all their bikes are belt-driven which is really innovative and a system that's increasingly used in commuter bikes. 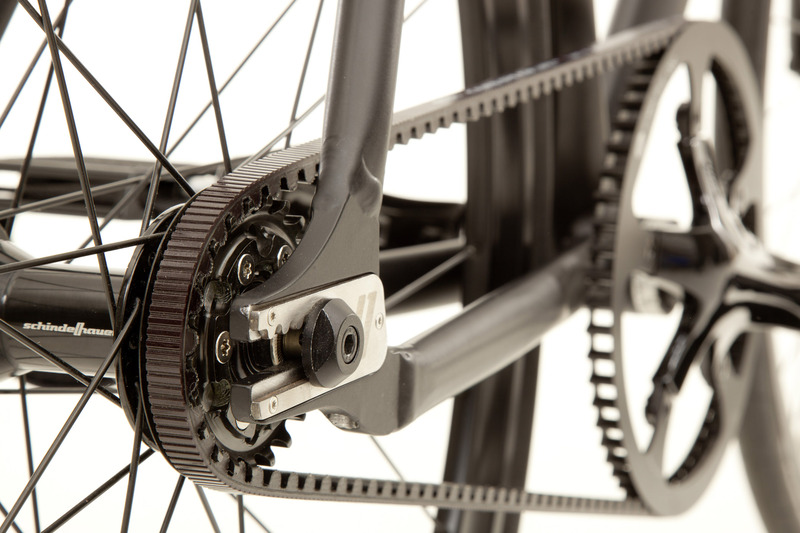 The Gates Carbon Drive doesn't need oil so there's no chance of getting anything on your clothes, it's very low-maintenance and a belt lasts for up to 20,000 km. The downside is that the chain can't be taken apart so you need a break in the frame to fit it. Schindelhauer themselves are pretty young but you can see from their site that their aiming at design and engineering conscious users. As you'll see from the pictures there's a lot of the Macbook Air design ethic going on! I read a couple of reviews which sang their praises - londoncyclist and bikerumour were the best ones. With the weather a bit better I popped along to Velorution to try them out - the shop was really busy with people checking out this seasons new models. 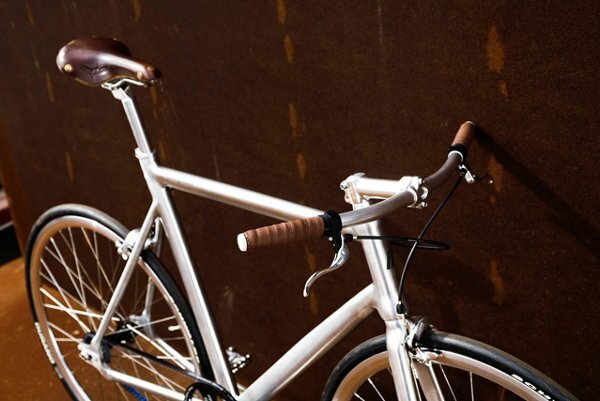 Velorution focuses on commuters and general bike users who are looking for a good quality and reliable bike. There isn't a lot of carbon-fibre road-biking or entry level bikes for kids.Instead everything is focused on urban cycling. They've got a really nice collection from interesting companies that have stood the test of time - Pashley, Strida and Moulton are just a few. They also had a range of electric bikes which looked cool, but weren't for me. I haven't bought that many bikes, and where I have it's sometimes meant a lot of time later messing around trying to get the fit just right. Like buying a pair of shoes it can be bit difficult to get a sense of the fit, until some time later you realise your little toe is squeezed and you're going to have blisters! So I spent some time talking to a couple of members of the Velorution team to find out more about the Schindelhauer collection and then tried a couple of models on the street. I tried out three different models. Then having finally settled on the right size I went out for a good 10 minutes to try and make sure that I really had a sense of what the bike could do and that it really fit my body size. 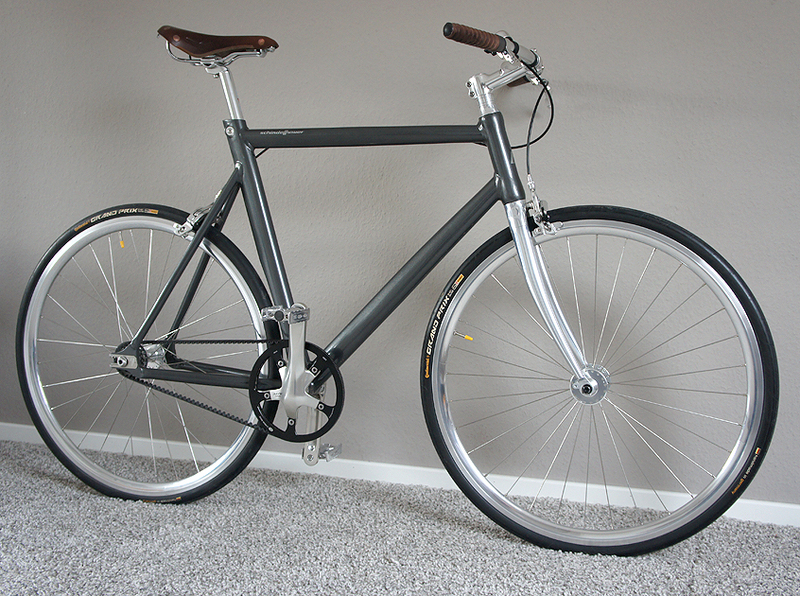 The Siegfried model is a totally stipped down single speed which felt pretty zippy and responsive on the central London streets. The most noticable things were how maneuverable the bike was and the acceleration away from the lights. It's not carbon fibre so you definitely know about the bumps in the road and I wasn't on the bike long-enough to get a sense of how much road noise I'll get in my hands. But, getting away from traffic lights was fantastic and with a tighter position you could get up to full speed quickly. I doubt I'll actually be pushing the bike anywhere near the sorts of speeds you could do on it. I felt it worked nicely in the traffic, maneuverable but without being jumpy. Perhaps the best compliment I can pay the belt drive is that I barely noticed it - at first it was surprising how quiet it was, but after a couple of minutes I forgot about it - as there was no meaningful difference in drive compared to a chain that I could tell. Having finished playing around I was still a bit stuck. The default is that the bike is unpainted giving you the benefit of the full polished frame - but that's a bit too sparkly for me! So after chatting with Greta and Jonathan Cole (the owners) they ordered the midnight blue frame from Germany for me. It should take a couple of weeks to come over and be set-up. I can't wait! Over the couple hours I was at Velorution I really enjoyed my conversations and everyone was really knowledgable and helpful. I'm excited about getting my hands on the bike and we'll have to hope I made the right choice! 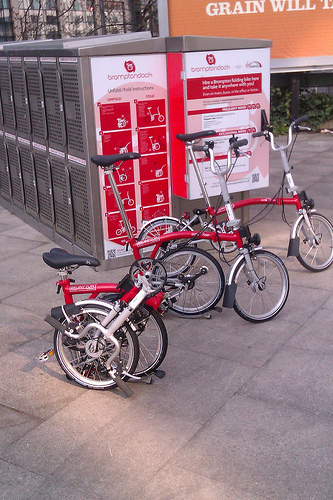 If you like the idea of a Brompton but don't want to buy one then I discovered the Brompton Dock scheme which lets you rent a Brompton for as long as you want from 5 GBP a day.